Lakmé Fashion Week 2018: To Men That Ruled The Show! This year’s Lakmé Fashion Week had all eyes on the stereotypes the men of the silver screen men broke in fashion. Presenting a run-through of looks from the runway that created a stir. Prateik Babbar stole the show in his asymmetrical kimono jacket paired with grey trousers and a wraparound skirt. Sporting the ‘Drag Queen’ look with a flawless effortlessness, he strutted in style for Sohaya Misra’s label Chola. The sensational Shahid Kapoor closed the show for designer Amit Aggarwal at Lakmé Fashion Week 2018 in a structured black outfit complete with glitter embellishments. Heartthrob Gurmeet Choudhary strutted effortlessly in a bias closure black/grey kurta and dhoti for Soumodeep Dutta. His collection ‘Aalo’ was inspired by the lotus and life in Buddhism. Weaving brocade and chanderi into plant based fibre Tencel, designer Rajesh Pratap Singh played with Indian ethnic silhouettes. The debonair Rahul Bose turned showstopper for Rajesh Pratap at Lakmé Fashion Week 2018. In Kunal Rawal’s mock layering traditional outfit, Varun Dhawan radiated pink vibes for Men’s fashion. With a black waistcoat and asymmetrical buttonless sherwani, Varun serves Kunal’s ‘Perspective’ collection to the audience with a little Cirque Du Soleil face art to accessorize. Angad Bedi was on fire in Payal Singhal’s sherwani oozing royal vibes. His soon-to-be mother wife Neha Dhupia was his arm candy. The beige base and its exquisite embellishments, perfectly complement the soft teal kurta. Decked in an asymmetrical bandhgala, Sonu Sood wore a Siddhesh Chauhan creation from his Samurai-inspired collection. 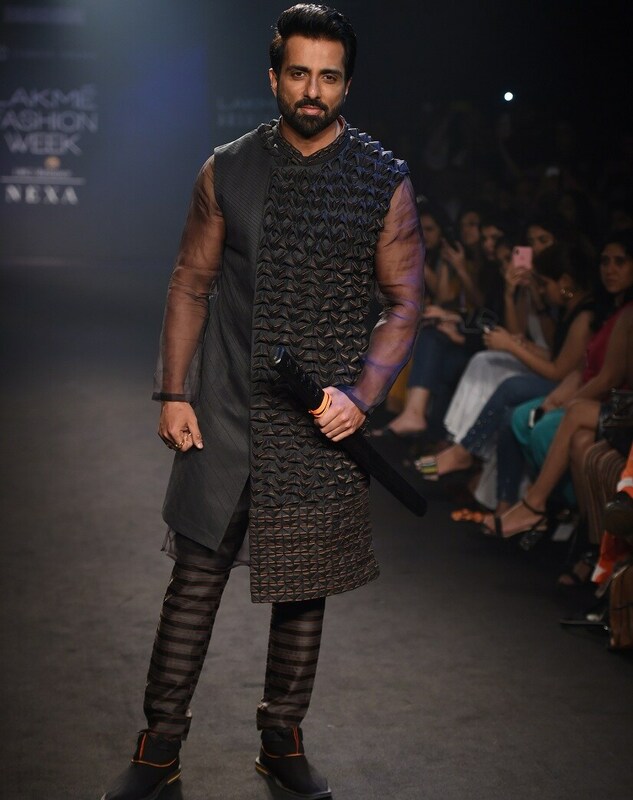 The sword in his hand made him look like a complete warrior on the Lakmé Fashion Week 2018 ramp. 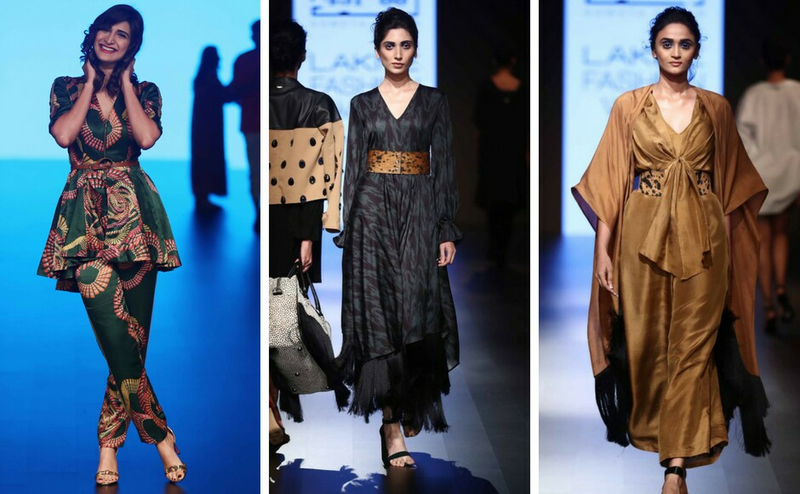 Lakmé Fashion Week 2018: Setting The Ramp Ablaze With Glam! 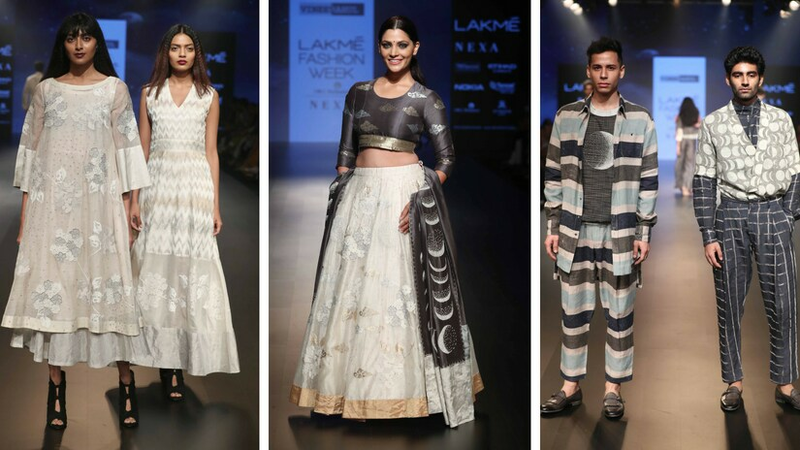 The elaborate lounge like stage area was graced by some of the most stellar names this year at Lakmé Fashion Week. Here is a recap of all that was fabulous on the ramp. Rhea Chakraborty’s black and gold gown emblazoned with a golden bird perfectly relayed the concept of breaking free as she walked on the ramp as the showstopper for Urvashi Joneja. A perfect amalgam of soft silhouettes and austere colours Shweta Kapur’s Collection 12 threw major layering inspirations. Actress Aahana Kumra looked endearing as ever as Shweta’s muse. Sushmita Sen stupefied the room as she strode in an unconventional jumpsuit draped saree with a reversible harlequin pallu. As the showstopper for Sunita Shanker, Sushmita carried the fusion like no other. Decked in a Nachiket Barve creation, Janhvi Kapoor made her runway debut at Lakmé Fashion Week this year. The multi-hued lehenga with intricate floral embroidery was paired with a pink dupatta. Soon-to-be mother Neha Dhupia showed off her baby bump as she walked alongside husband Angad Bedi in a floral printed beige peplum top over a lehenga skirt. The couple turned showstoppers for designer Payal Singhal and looked ravishing in their matching attires. Vineet Rahul’s collection ‘Chandni Raat’ had dramatic layers of chanderi with ornate hand embroidered surfaces. Bollywood diva Saiyami Kher gracefully glided in a white embroidered lehenga and grey choli accompanied by an embellished dupatta. Donning a gilded lime green lehenga with a tulle dupatta, Malaika Arora Khan walked for designer Anushree Reddy at Lakmé Fashion Week 2018 . She glorified the ramp looking like an absolute vision. The enthralling Kangana Ranaut dazzled in blue sleeveless gown with shimmering florals for Pankaj and Nidhi. Her prominent blue eyeliner perfectly complemented her outfit. Jacqueline Fernandez flaunted a retro hairdo to accompany her avant-garde one shoulder tunic. She fabulously waltzed on the ramp for designer Ashish N Soni. Ruceru’s collection at Lakmé Fashion Week 2018 was inspired by Rabindranath Tagore’s timeless dance drama ‘Chitrangada’. Bipasha Basu looked the perfect Bengali beauty that she is in the structured A-line silver skirt and red blouse, complete with a sequined red cape. The ever stunning Kareena Kapoor Khan wrapped up LFW18 in a holographic outfit. She was the showstopper for Monisha Jaising’s collection ‘Shades Of A Diva’. Aditi Rao Hydari was back on the ramp after India Couture Week for designer Jayanti Reddy. She looked utterly impeccable in a dusty pink outfit with silver embroidery.